STEP 1 TO A BETTER NIGHT OF REST: GET RID OF YOUR OLD MATTRESS! Say goodbye to that old mattress and box spring combo. Friendly, award winning service. Zero obligation estimates. Don’t let your unused mattress clutter a room or deteriorate in a garage. For mattresses that are damaged from infestation, they must be professionally treated to be picked up. Regardless, no excuse is worth it because it can take up space and eventually cause more problems than it’s worth. Luckily, Junk Boss makes this easy for you because we drive to your home at your convenience and handle every aspect of removing it for you. Remove it now. Not later. Mattresses, box springs and even old bed frames can take up more space than their worth in your home. Since they are such critical items, you want to make sure they still give you a great night’s sleep. Typically, mattresses should be replaced about every 8 years because its comfort and support will degrade. It can also be ruined by certain spills, insect infestations, or the natural accumulation of detritus. If you’ve just replaced your bed, box springs, mattress or your entire sleeping arrangement, call us to quickly and easily remove the outdated items you don’t need. Don’t let a good mattress go to waste. Sometimes you might end up with an extra mattress for no reason and without a need for it. Many times when this happens the mattress is fine, it’s simply not in use. No matter the reason or the state that it’s in. Often times it can be recycled. Unfortunately, if it is left without care in some forgotten space, it can be ruined. If possible, Junk Boss will propose any efforts to make sure a mattress doesn’t go to waste. No waste is too great! 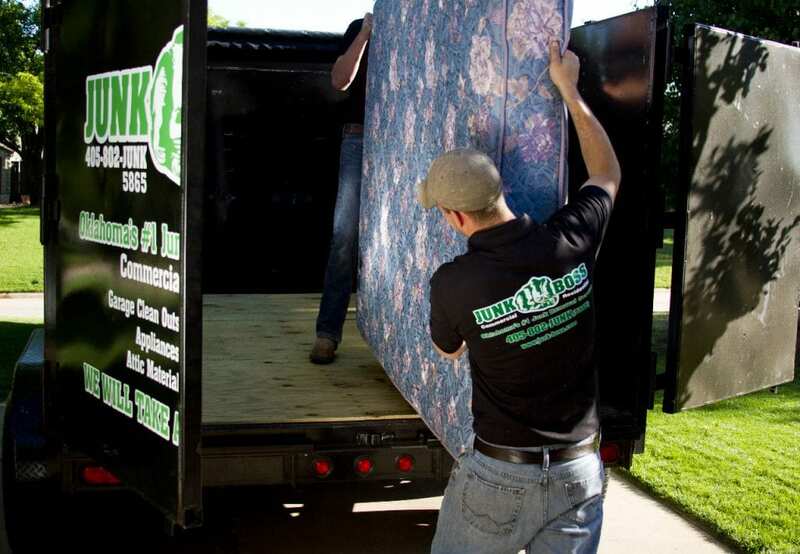 Junk Boss is based in Oklahoma City and is experienced in reliable junk removal. We are a uniformed professional disposal company that offers commitment free quotes. From a washroom to a warehouse, no junk removal job is too big or small for us to handle. Contact us now to start getting junk out of your way!